Now on the tenth chapter, maybe 60% through the plot of my next historical novel, due at HarperCollins in early November (very early, Nov.1), I discover that writing on a deadline is 1) very hard on the back; and 2) you learn a lot of little stuff which may or may not fit in your plot but feeds a writer’s lust for historical trivia. So I’ll share my random pickings with you. 2. The heavy post-Victorian hats were held on the above mentioned hair extravaganzas with hat pins as log as your (or my) arm. Some hats included stuffed birds. 3. In the early 1900’s only one in eight Americans finished high school. 4. Vaudeville theaters (figure heavily in my novel) had shows that ran continuously through the day, rather like our moving houses, but with live performers. 6. The 60’s hit “I’m Henery the Eighth” was a 1910 hit first. Who knew? 7. Passenger pigeons used to make flocks that were 300 miles long, darkening the sky. 8. In researching the age of the term “pony tail” I discovered that a recent U.K. research team has done mathematical modeling to predict the shape of a pony tail (a human’s pony tail) based on “various factors”. Why? 9. 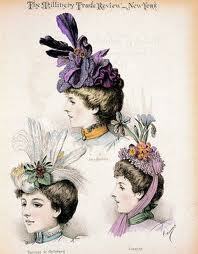 Cleveland, Ohio was once the second largest producer of women’s clothes. 10. The 50 hour work week was once a fond dream of American workers. Many said it would never happen. Unions thought otherwise. 11. Women earned half to two-thirds of men’s salary for the same work. Of course now we’re at 77% . . . so history doesn’t advance on all fronts.